It’s thru-hiking season, and you may be feeling inspired to start planning your own thru-hike on the Appalachian Trail. Whether you pack up and go for the full trail or just section hikes, RootsRated has the training trails that will get you in shape for long miles. Our picks for the top 5 hardest hiking trails in Georgia will get any potential thru-hiker in shape for their trek. The James Edmund Trail is located in Black Rock State Park , the highest elevation state park in Northern Georgia. This 6.25 mile loop trail wanders through steep elevations. You’ll begin the trail with a nice steady decline deep into the state park woods. There are some creek crossings that will offer hydration, so be sure to fill up because there is no water at the summit. At one point, the trail gains almost 900 feet of elevation in less than a mile. The trail is rated a D4 for its elevation gain to the summit at 3,600 feet. At the summit, you are rewarded with a great campsite, (but no water so pack your own) and an awesome view. A panorama exposes you to an expansive view towards the Smoky Mountains. Some say this is one of the most difficult hikes you can find in a Georgia state park. But your hike is only halfway through. Head back down the mountain to complete your loop, where this time you take a steady incline to the trailhead. Parking is $5.00 for the day and you can park right at the trailhead. If you want to get a real feel for the Appalachian Trail, then do this hike. The 10 mile one-way from Woody Gap to Blood Mountain will give you a workout you won't forget and the payoffs are big. In the first 3 miles you will experience “Preachers Lookout” which will give a spectacular views, and at the same time, one heck of a workout. Better than a Stairmaster for sure. 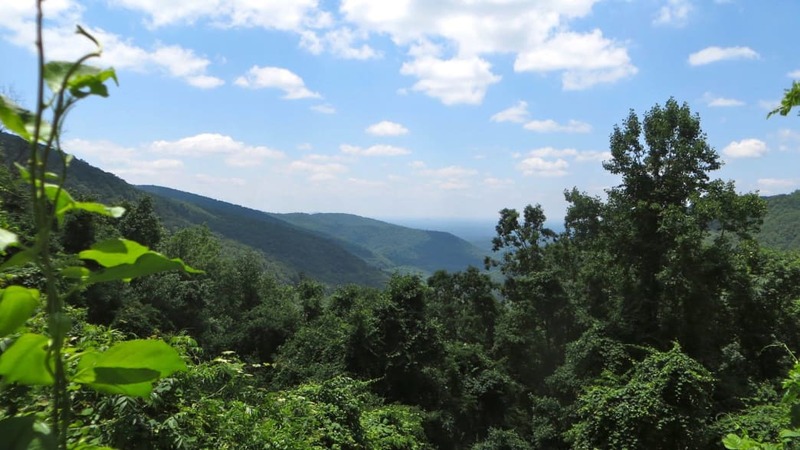 The trail travels to beautiful summit views at Big Cedar Mountain, through rolling mountain ascents on some amazing trail switchbacks, and through wildflower and fern-filled mountain gaps in the Blood Mountain Wilderness. Continue following the AT from Jarrard Gap and then crest the Blood Mountain summit via the Appalachian Trail. Just before your climb up to Blood Mountain, you’ll pass a small stream, where you can fill up on water. Take a break at the Blood Mountain Shelter, and climb on the adjacent the craggy rocks for some spectacular views. The AT departs the Blood Mountain summit, continuing its northbound journey in a descent to Neels Gap, where the welcoming Mountain Crossings Hostel awaits with cold drinks and calorie-laden foods. The view-packed Appalachian Trail segment from Woody Gap to Neels Gap totals 10.6 miles one way. Parking is Free at the Woody Gap Trailhead. 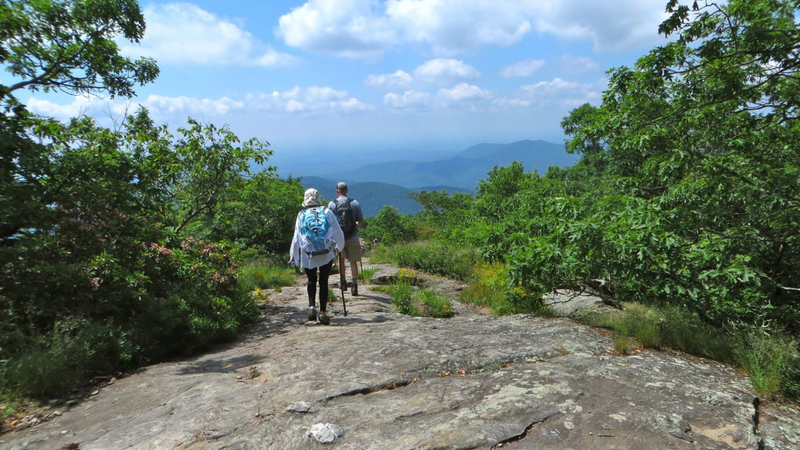 Hike the Arkaquah Trail on an 11-mile out and back from Track Rock Gap Road to Brasstown Bald. The hike offers stunning ridgeline views and challenging climbs. Make sure to complete your hike at the Observatory for Brasstown Bald to make it one heck of a climb. The hike departs the Table Rock Trailhead parking area, diving elevation into a dense canopy of rhododendron. At the first mile, the Arkaquah Trail reaches an overlook, where you can scramble over a flat rock outcrop to catch the first of many long-range views. Departing the overlook, the trail rises to cross a massive, lichen-covered rock outcrop in a clearing at 1.35 miles, with views extending south. The Arkaquah Trail carves into the mountaintop, becoming rocky. Boulders tower over the trail’s sides. The trail ascends on switchbacks as it rises in elevation. Several small streams flow across the overhanging, mossy rock outcrop, dripping and chasing lower elevation. Upon completion, you have accomplished one of the toughest trails in Northern Georgia, with an elevation gain of roughly 7,300 feet. Parking is Free at the trailhead. Hiking this trail is not for the faint in heart. This trail is rated a D5 hike. Also, hiking this in a single day is not recommended. However, it's been done many times. The 12.8 miles round trip might have you wondering how on earth you'll make it to Maine, but don't be too discouraged. Rated one of the toughest trails in Northern Georgia, this is the perfect trail for thru-hike conditioning. The access to this trail lies in Vogel State Park. Get their early, because it will be a long day. Follow the green blazes from the Visitors Center and turn right at a sign near cabin number 7 that serves as the entrance for both the Coosa and Bear Hair Trails. Climbing alongside Burnett Branch, the Coosa Backcountry Access Trail climbs through a forest typical of the North Georgia mountains. Hike the Coosa in a counter-clockwise direction, so turn right at the T. Easier to do it in a day. At mile 6, the half-way point, you are on Coosa Bald and probably seeing an amazing view. After heading back to Vogel State Park, you can claim you did a 5,300 feet elevation gain. Parking is $5.00 for park entrance and you can park at the trailhead. For Atlantans who want to travel a short way to one of the most popular (but strenuous) trails in North Georgia, get on the Appalachian Trail and hike up Tray Mountain . Why? Because the views from the Tray Mountain summit are amazing—to say the least. 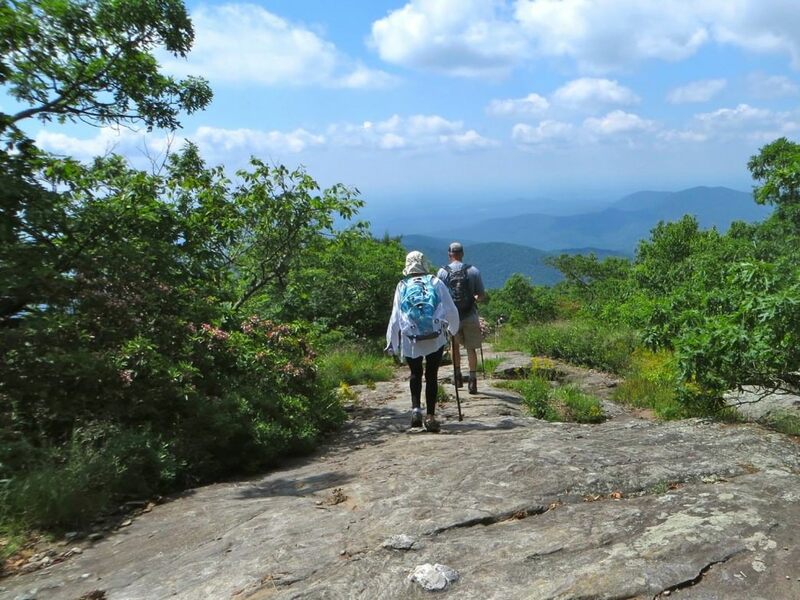 This 5.2 mile out-and-back hike treks through beautiful valley terrain at Indian Grave Gap before climbing a scenic ridgeline in its Tray Mountain approach. It’s rated a D4 hike that will have you breathing hard, but very fulfilled. The hike reaches Tray Gap at 1.8 miles, crossing Tray Mountain Road at 1.85 miles and entering the Tray Mountain Wilderness. 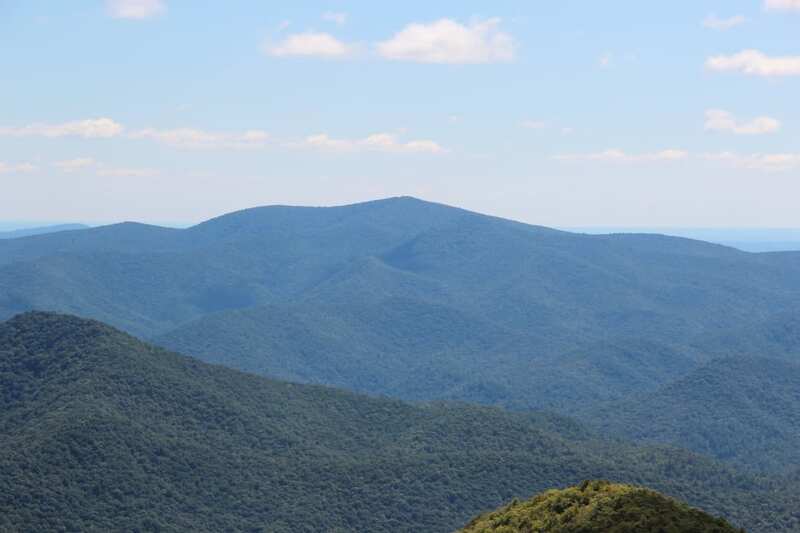 At this point, the Appalachian Trail has covered over 2/3 of the distance—but has only climbed half of the elevation—to the Tray Mountain summit. The last 0.7 miles climbs a considerably steeper incline, switchbacking twice before meeting the sheer face of a blocky, towering rock outcrop at 2.2 miles. The AT reaches the Tray Mountain summit after 2.7 miles from Indian Grave Gap. The wind-swept trees hugging the mountain’s high elevation disperse at the peak, offering views of sweeping vistas on both sides of the trail. The hike doubles back to the Tray Mountain summit, retracing the Appalachian Trail toward Indian Grave Gap. The return, almost entirely downhill. It's an amazing hike back down to your car. Written by Scott Janz for RootsRated. Hiking to Mount Rogers: The Best Day Hike in Southwest Virginia?